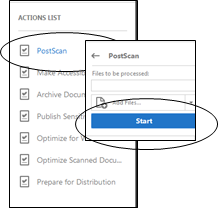 When you have completely scanned a folder or an individual item, run the PostScan action in Acrobat. 28. In the Action Wizard, click PostScan in the right sidebar. 30. A box might pop up asking you to save. 31. Click OK—you can check the Do not show box. 32. The action will continue to run. 33. If any part of the action fails or displays a warning icon (yellow triangle with an exclamation point), please inform the Digital Asset Manager ASAP. Please do not close the file or action sidebar. 34. When complete, the blue button will be grayed out, show Completed, and a blue bar will appear at the top claiming PDF/A compliance. 35. Close the file and return to Create PDF from Scanner to scan the next item (remember to check Entermedia for existing files first!). Remember to set the resolution to 300dpi. 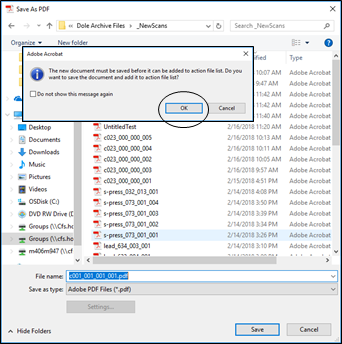 What if the PostScan Action isn't displayed in Adobe Acrobat? It needs to be installed. Talk to Archives staff.